Most of us, having only a vague understanding of the Senate's possible functions and past realizations, see it as illegitimate or undemocratic, and wish to correct the situation by applying one of two stereotypical and superficial recipes: election or abolition. Red Senate Chamber of the Canadian Parliament - Parliament Hill, Ottawa, Canada. See more in my portfolio. I wish to demonstrate that there are multiple forms of legitimacy, that the Senate is legitimate in its own way, and that the best way to reform it is to help its culture evolve. Equating democracy with elections is confounding the part for the whole. A regime is democratic when it tries to realize the well-informed will of the people in a just way, taking into account minorities, and limiting the natural excesses of the governors and the governed. Democracy is the result of the interaction of numerous actors and institutions such as the government, parliament, courts of justice, public administrations, military and police forces, the press, associations, pressure groups, large national and multinational companies, and public opinions. Democracy is compromised when any one of these components weakens, hardens, or expands immeasurably. Most of the actors mentioned above are not elected, but they are each legitimate while they maintain their natural role. All democratic regimes have elections, but not all regimes with elections are democratic. Zimbabwe, Russia, and even Turkey are examples of the latter. To better understand the various types of legitimacy, let's look at another group of people who, like senators, are appointed: judges. Few people would reject their judgments because they are not elected. Because judicial thinking requires a long training and much practice as part of an ancient tradition, these jurists are strongly constrained by their predecessor's work and the reflections of their peers. They try to base their reasoning on the most probable facts while avoiding personal biases. Sometimes I wish we would see more of that in our politicians! Since our ignorance is profound and our prejudices are most often disguised in seductive appearances, it is certain that judges will sometimes fail. This is why the judicial system has provided various levels of appeal with panels of three and nine judges. All these parts form a whole, making the judicial system legitimate, without elections. "The framers [of the Constitution] sought to endow the Senate with independence from the electoral process to which members of the House of Commons were subject, in order to remove Senators from a partisan political arena that required unremitting consideration of short-term political objectives." "The appointed status of Senators, with its attendant assumption that appointment would prevent Senators from overstepping their role as a complementary legislative body, shapes the architecture of the Constitution Act, 1867." "The proposed consultative elections would fundamentally modify the constitutional architecture we have just described and, by extension, would constitute an amendment to the Constitution. 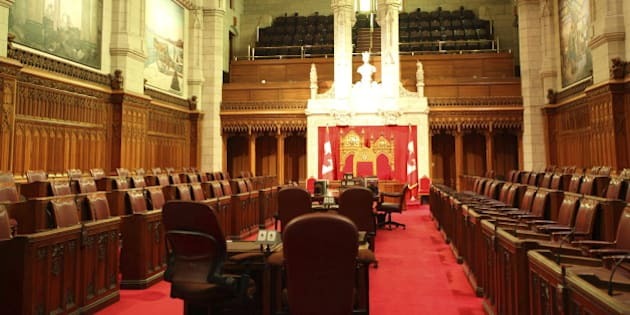 They would weaken the Senate's role of sober second thought and would give it the democratic legitimacy to systematically block the House of Commons, contrary to its constitutional design." The Canadian Parliament is a complex ecosystem of governance, which has adapted and evolved over almost 150 years. The Supreme Court invites us to think deeply before changing its workings, because it is probable that piecemeal modifications would have unintended and undesirable consequences. Central to the doubts about the legitimacy of the Senate is the nagging thought that it can impede governance by systematically opposing the will of the Commons. One hundred and fifty years of history should be enough to demonstrate that this is baseless fear. If the Senate is such a danger, we would have noticed it by now. Better to have a Senate and use it lightly than not have it at all when we really need it. Without going into details, we can see that the Senate has from time to time blocked proposed legislation, its most recent active period being from 1988 to 1990 when, having a Liberal majority, it opposed the Mulroney government on three key issues: abortion, the GST, and free trade. The Senate, having a real power to block legislation, uses it sparingly, tempered by the absence of electoral legitimacy, its culture and history, and by public opinion. Why bother with all this? Wouldn't it be simpler to get rid of it? Not so fast! In 2007, Eoin O'Malley published a study (The Power of Prime Ministers: Results of an Expert Survey) comparing the legislative power of prime ministers in 22 parliamentary democracies. He found that Canada's PM is, by far, the most influential. The more the PM's office concentrates power, the more we need counterweights. The House of Commons can hardly take on that role, except during a minority government, so we are left with only the Supreme Court and the Senate. Senators have generally been chosen in a partisan fashion, appointed for their loyalty to the governing party. This constitutes an assembly with reduced possibilities of complementarity compared to a non-partisan body. When the majority in the Senate corresponds to that of the Commons, its critical sense is diminished. When power changes hands, it often has a tendency to think in opposition rather than in complementarity with the Commons. As long as that assembly remains partisan, it will function well below its capabilities. If we remove the Senate, we will lose forever that source of enrichment to our legislature. For all these reasons, the Senate has its very own legitimacy, different from that of the Commons. Adopting a nonpartisan nomination and selection process will help it to realize its full potential.